But media representations of NBN "overwhelmingly negative". The voting public does not see the national broadband network as a waste of money despite largely negative media coverage, a new study by the Institute of for a Broadband-Enabled Society (IBES) at Melbourne has found. Surveys conducted for the Framing the NBN paper [PDF] by University of Melbourne and Swinbourne University of Technology researchers found respondents predominantly welcomed the NBN and felt it would be of personal benefit to them. people have a negative or positive opionion of the NBN. More than two thirds of those surveyed had a positive attitude to the NBN, according to the paper. Respondents also believed the NBN would improve the digital economy and social equity, and did not think the network was too expensive or a waste of public money. While Australian Labor Party voters were the most positive about the NBN, with 79 percent in favour of it, the researchers note that 58 percent of National Party supporters also approved of the project. 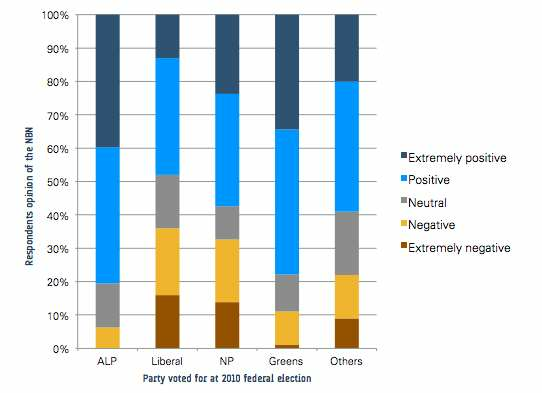 Liberal Party voters were the least positive about the NBN at 48 per cent; the Liberal cohort also had the most responders with a negative opinion about the NBN. The high positive rating is reflected in the proportion of survey respondents who said they would connect to the NBN: according to the researchers, 54 percent of those asked said they would hook up to the broadband network. While most who took part in the survey believed internet access was important for their daily lives and thought themselves to be heavy users, most were happy with their current home service. Those surveyed said they gleaned information about the NBN mainly from newspaper reports which the researchers note were "overwhelmingly negative", focusing on network rollout delays and the perceived high cost of Labor's fibre-to-the-home variant. This, the researchers say, contradicts the strongly positive public attitude towards the NBN and warrants further investigation. The researchers used an online survey of 2180 people to work out broad trends in public attitudes towards the NBN and also carried out 25 interviews of different households. They also analysed 1060 articles from News Corp and Fairfax newspapers The Australian and The Age on the NBN.